An insanely delicious and refreshing Strawberry Cheesecake Ice Cream Recipe filled with the amazing flavors of cheesecake and spring strawberries. I consider myself a pretty avid cookbook collector, adding at least 6-8 new titles (sometimes more) per year. However I’m not an avid cookbook cook. I love to buy one for the sheer enjoyment of holding it in my hands, thumbing through the delectable and colorful images and reading the beautiful prose within the pages. I love the “idea” of actually cooking from cookbooks but I need to do a better job of actually doing it. 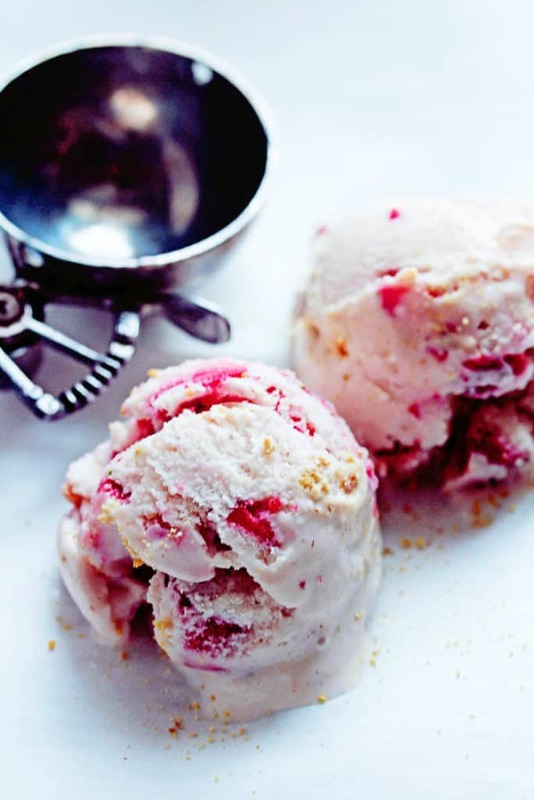 That’s where this Strawberry Cheesecake Ice Cream recipe comes in. I loved the cheesecake taste of this ice cream. It really did feel like I was eating cheesecake in frozen form. The strawberries were a fantastic touch. One of my fave cheesecake flavors is strawberry so I was sold right away. This is a great recipe for Valentine’s Day or even to pull out this spring and summer when all you crave is something cold and fast that won’t require an oven. One thing to note is that this ice cream freezes up pretty quickly because there is no custard and the alcohol addition is optional (I suggest adding it). I enjoyed it more the first day when it was still quite soft and pliable. 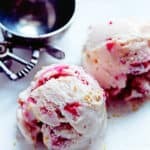 I’m glad I tried this Strawberry Cheesecake Ice Cream recipe, and I can’t wait to pull out more cookbooks and get busy! It was a great change of pace from your typical strawberry ice cream recipe or even a quirkier cheesecake ice cream recipe. P.S. It is always nice to sometimes try someone else’s recipes and not think about recipe development. I also found that the process inspired new ideas for recipes I wanted to create. 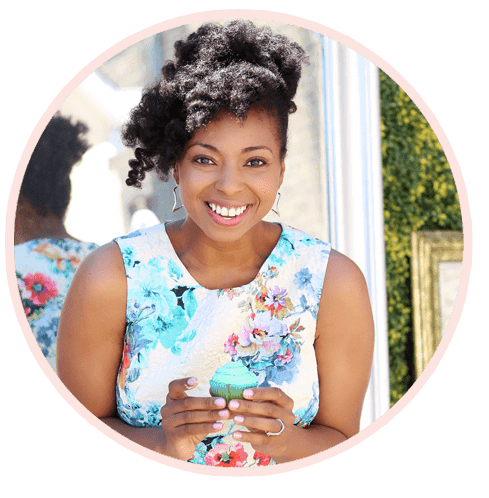 We food bloggers should do this more! Win Win! Author: Joy Wilson "Homemade Decadence"
In a blender, combine the half-and-half, lemon juice, vanilla, vodka, if using, cream cheese, sugar, and salt. Blend on high until smooth. Add 1/2 cup strawberries to the blender. Blend until smooth. Churn the mixture in an ice cream maker according to the manufacturer's instructions. During the last minute of churning, add the remaining strawberries and the graham cracker crumbs, if using. Transfer to a freezer-safe container and freeze for at least 4 hours before serving. Ice cream is best served within 5 days of churning. I am so excited to try this recipe. Instead of graham crackers, I am gonna use Biscoff cookie crumbles! Also-why the vodka? How does it enhance the flavor…? Oh that sounds amazing. The vodka helps keep the ice cream from getting to firm and freezing too hard. Thanks for this yummy recipe,,, please what is ‘half and half’ ‘?? Hi Mariam, its half heavy cream, half milk. Sorry for the late response! This I must try. Anything strawberry. This ice cream looks delicious and I love the strawberry chunks. The strawberry chunks are my fave part! I saw this on Facebook and went nuts! Yas! 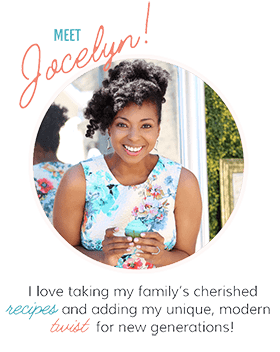 Yas, Jocelyn! I love, love, love collecting cookbooks, but hardly ever turn to them when it’s time to cook/bake. Both of Joy’s cookbooks are sitting on bookshelf, and after seeing this ice cream I must start using them. Delish! I can relate to buying a lot of cookbooks, but not really using them that much to cook from. I love to collect vintage cookbooks and read them like novels. I also like to collect baking books and read them over and over again, I don’t know, I guess I just find them fascinating. I find them fascinating as well Neeli! I need to do a better job of actually baking from them however. I know, right? 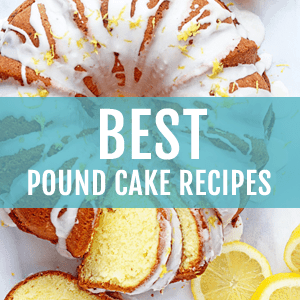 I collect and save so many recipes from blogs that I may never have the chance to try them all. I haven’t made ice cream in forever! I must fix that and whip up a batch of this delicious treat! This is definitely a nice way to get out of that rut! Jocelyn, we’re like the same person, you and me. I have about 50 cookbooks (and counting), and I rarely cook from them. I love thumbing through the pages for inspiration, but I rarely make any of the recipes. One of my New Year’s resolutions is to cook more from my books. This ice-cream looks absolutely amazing. It’s never too cold for ice cream. Pinned. OMG isn’t it so addicting to keep buying cookbooks? I should seriously be so ashamed for buying so many books and having them just sit on a shelf. Jocelyn, this looks soooo good!!! I did have a question: what type of ice cream maker do you have and how do you like it? I’m in the market for one. Thanks in advance! Hi Rae, I have a Cuisinart 2 quart ice cream maker and I love it. It has been great for me for the last few years but there are some others that are just as good and not as pricey. Also check out Hamilton Beach and of course if you have a KitchenAid mixer, you can get the attachment. It is such an addiction. I don’t know if there’s anything better than cheesecake + ice cream! 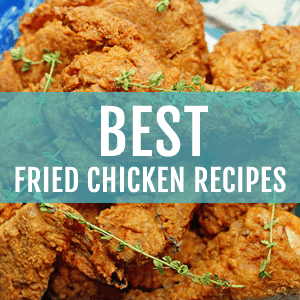 Definitely glad you picked this one out of Joy’s cookbook to try! The two together are pretty incredible right? I want more cookbooks, but I never buy any because I get suckered into thinking that I can look it up online. Not as fun but still handy! So true. With so many recipes online now, cookbooks are not as necessary. They are definitely my go to splurge. I loooove cheesecake ice cream. Love the strawberry too. Perfection! Now that is one amazing ice cream! 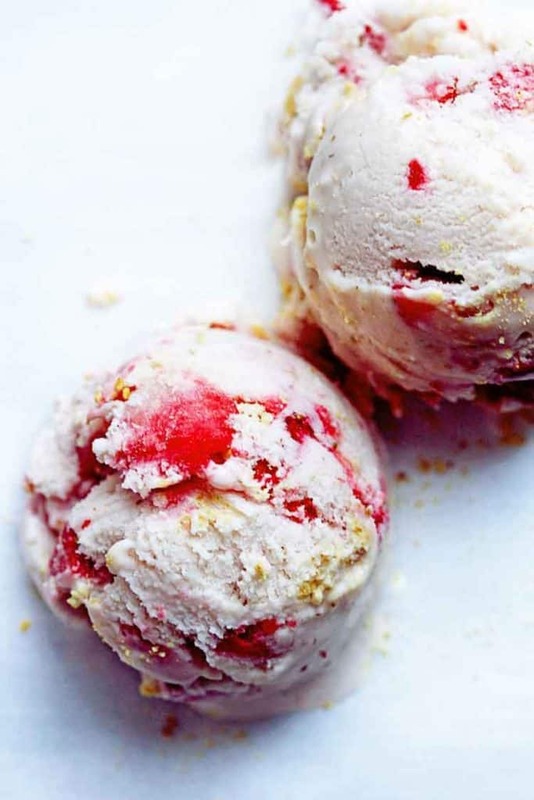 I have yet to get Joy’s book. . but this one is at the top of my list of “to buy immediately” cookbooks. . thanks for sharing Joy’s strawberry cheesecake ice cream recipe. . I created one last year that I loved. . will have to try this to see how good it is! 😛 looks great!! I love all the ice cream recipes in that book. I’ve bookmarked a few for the warmer months but this just looks perfect!! Can’t wait to see which ones you try. Cheesecake Ice Cream? I’ll take that! Delicious idea, Jocelyn! I love that you always post ice cream recipes when it’s old out! The idea for this ice cream is awesome!! Two great things combined into one! 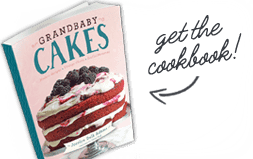 Joy’s cookbook is great– there are so many recipes that I’ve been wanting to make! I think ice cream in the cold is my thing! Yes I am so glad there are so many like me out there. Oh, be still my beating heart! I am wiping the drool away with no shame 🙂 This ice cream has so many good things in it–and now I want to eat a pint of it, even though it’s freezing here! Yeah girl! I know that feeling. Eating ice cream is still necessary in freezing weather. In strawberry heaven! Simply divine! This looks incredible, and so easy too! It’s 30 degrees outside but this is all I want to eat right now! I love collecting cookbooks too but fail at actually using them. Joy’s food always looks so amazing. You did this cheesecake good. Yum!! oh yeah I am really good at the collecting part too. Oh my! This sounds like just what my wednesday needs and it’s summer where I live so this is perfect for cooling off. I so wish it was summer where I live haha! Even though it’s freezing outside, this ice cream looks so amazing right now! I love ice cream all year round and it is sooo freezing here too! I am the same way with cookbooks! I just love them for the inspiration but most of the time I’m winging it in the kitchen. But these looks delish and so simple. Perfect for V-day! Yep I gotta try more cookbook recipes from now on. Oh my word. This looks crazy delicious! I also love using recipes from cookbooks. It’s fun discovering new recipes and there’s no fuss with the testing and remaking and testing again. Much more relaxed! Yep agreed. It was totally relaxing just following a recipe for once. I have a serious cookbook problem and have definitely been collecting more than 6-8 recently. I am running out of room! They’re the one thing I love to collect. This ice cream looks absolutely decadent. I’m terrible with these cookbooks. I totally had to scale back for sure because I am officially out of room!!! I love my cookbooks. They are treasured items. But like you, I rarely cook from them. I guess I just like looking at the pictures and reading the stories! This ice cream looks amazing and perfect for Valentine’s day. Of course Joy would hit it out of the park! Yes I am glad there are so many like us out there. I need to do better but this was an easy recipe to start with. I am all over this cheesecake ice cream, girl! It looks so tasty! Swoon! Gosh it is pretty darn yummy. This is pretty much everything I love in one awesome recipe. Yum!